TORONTO, July 10, 2018 /CNW/ - First Cobalt Corp. (TSX-V: FCC; ASX: FCC; OTCQX: FTSSF) (the "Company") is pleased to announce that drilling in the Canadian Cobalt Camp has identified a second cobalt mineralization trend within the Kerr area near surface extending over a 500-metre strike length. 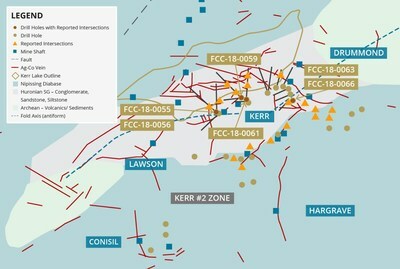 This mineralized trend is located parallel to and 400 metres north of the previously identified Kerr #2 Zone, which has been traced over 350 metres to date. "The results reported today are just 400 metres north of the Kerr #2 Zone, providing great encouragement to our vision of large scale open pit mining in the Cobalt Camp. We are reallocating a larger portion of the 2018 exploration budget to the Kerr area despite having a multitude of prospective targets across our land package. Results from nine drill holes are pending and additional drilling is planned. The valuation of battery metals explorers, developers and miners have come under pressure in recent months, however First Cobalt is well positioned to capitalize as market sentiment improves. Our programs are fully-financed into 2019, work programs in Idaho and Ontario are progressing well and we own a permitted North American cobalt refinery, giving us the potential to become a near-term producer outside of the DRC and in proximity to U.S.-based lithium-ion battery manufacturers." First Cobalt previously identified a network of multiple veins at various orientations in the Kerr #2 Zone containing cobalt and several other metals along with disseminated mineralization across a 350m strike length (see May 24, 2018 press release). Today's results confirm the existence of a second cobalt mineralized trend parallel to and 400m north of the Kerr #2 Zone. Cobalt mineralization has been traced within the known 500m strike length of the historic Drummond and Kerr Lake Mines. Fifteen holes totaling over 2,200m were drilled along the strike extent of the historic Kerr Lake and Drummond Mines, where several silver veins were known to occur. The silver veins occur at multiple orientations and are considered to be a continuous network of mineralization. Results show cobalt mineralization occurring as broad intervals beyond previously mined silver stopes. Assay results from the first six holes are reported today and results of the other nine are pending. Results reflect cobalt-silver mineralization as closely spaced veins and along fine fractures within broad zones, up to 26.7m in drilling width. The higher frequency of veining at both Kerr Lake and Drummond suggests the cobalt-silver mineralization previously reported from the Kerr #2 Zone may be a distal portion to this more extensive vein network (Figure 1). Further testing is required to determine the continuity within the vein network system. Results from the first six holes include 6.5m of 0.33% Co and 133 g/t Ag and 10.7m of 0.14% Co and 13.9 g/t Ag, including 6.9m of 0.21% Co and 12.5g/t Ag. Longer intervals include 26.7m of 0.05% Co and 13 g/t Ag within 40m of 0.04% Co and 9 g/t Ag. All of the holes reported today contain anomalous cobalt mineralization over long widths and results demonstrate an ideal structural setting for the development of a closely-spaced vein network in the Kerr Lake area. A complete list of results is available in Table 1. The Kerr area in Cobalt North contains several historic silver mines, including Crown Reserve, Kerr Lake, Lawson, Drummond, Conisil and Hargrave. This area produced over 50 million ounces silver and 900,000 pounds of cobalt, mainly between 1905 to 1950. Other past-producing mines owned by First Cobalt in the Cobalt North area include the Silver Banner, Juno, Silverfields, Hamilton and Ophir Mines. The deepest shaft was less than 200m. The Kerr Lake Mine consisted of thirteen separate shafts with over 20km of underground development. The Kerr Lake, Crown Reserve and Drummond Mines were initially mined individually and later connected by underground workings for silver exploration and drilling. The vein system at Kerr and Drummond is extensive, covering an area of more than 650m by 250m, and is considered part of a continuous network. Previous exploration did not assay for cobalt, making the area is highly prospective. Drill holes were planned using a proprietary 3D geological model based on digital compilation of historic mine workings, integrated with exploration drilling and surface bedrock geology maps of the entire Kerr area compiled by First Cobalt. The historic Kerr Lake and Drummond Mines were targeted to test for cobalt mineralization adjacent to the previously mined silver-rich vein system. Sampling of muckpiles from the Drummond Mine indicated cobalt mineralization is associated with silver as well as copper, zinc and lead in the wallrocks to veins (October 26, 2017 press release). Various drill orientations were designed to test the full range of vein directions that occur. Within the drill holes, multiple orientations of veins were measured, with two prevailing directions: 1) an easterly orientation transecting both Huronian sedimentary and volcanic and Archean rocks and 2) a northerly orientation following sedimentary rock horizons within the Huronian and Archean sequences (Figure 2). At the Kerr Lake Mine, historic underground workings extend over 500m along the strike length of the vein network. Four of the six holes are from this area, testing the wallrocks within underground workings. Assay results show cobalt minerals occur within discrete veins and along fine fractures. Silver is associated with cobalt, but distinct silver-bearing minerals were not noted. Holes FCC-18-0055 and FCC-18-0056 are collared from the same station and holes FCC-18-0059 and FCC-18-0061 are collared from a single station to the east. Cobalt mineralization within these holes reflects an approximate strike length of 200m for the known vein network system. Two holes at the Drummond Mine targeted historic silver mineralization within a sedimentary rock unit near the Archean-Huronian contact. The unit strikes north-south and holes were oriented to test along the strike extent. Hole FCC-18-0066 intersected several cobalt veins within a volcaniclastic rock unit not previously considered as a typical host to mineralization. The volcaniclastic unit has not been previously described in the Cobalt Camp and may have been considered part of the Archean rock sequence. However, the flat lying orientation of the unit confirms a Huronian position, thus represents a unique style of mineralization not explored previously. Additional holes have been drilled to test this unit with assays pending. In all six holes from Kerr Lake and Drummond, elevated values of copper, zinc and lead were encountered. Minerals containing these metals occur within the same veins as cobalt minerals as well as within separate veins extending beyond the intervals reported here. 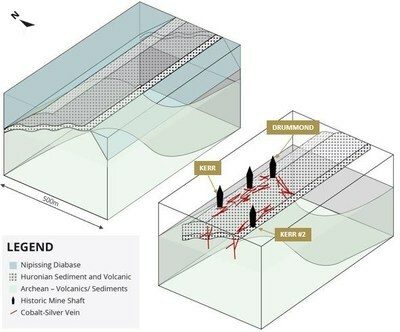 Copper, zinc and lead are considered peripheral metals to the cobalt-silver mineralization and reflect a zoning pattern that further defines the limits of the vein network system. In hole FCC-18-0056, outside of the reported interval of 83.1 to 84.9m, 1.40% zinc and 1.00% lead with 13 g/t silver occurs over 1.23m. Further down the hole, zinc grades in individual veins are up to 4.5% over 0.3m in the interval between 134.5 and 135.9m. For a table of drill hole locations and assay results to date, visit https://www.firstcobalt.com/projects/greater-cobalt/cobalt-north/.